That bit of news a couple of days ago gave me only a small measure of melancholy as my memory of the Flxible Hilltopper is a strong one. I even remember, as if it were yesterday, the muffled roar of its engine. Watching it zoom by from the vantage point of my dormitory in the main building at St. Ed's High School was as thrilling as watching the McDonnell F-101 Voodoos from the nearby Bergstrom Air Force Base fly by overhead towards the Austin State Capitol on the horizon. The Flxible Hilltopper was the bus that was attached to the nearby St Edward's University. We shared the campus. Alas we did not share that bus. It was called the Hilltopper because students of the university (the campus perched high on a hill overlooking what then seemed a far away and low skyline. The horizon was only broken by the white marble State Capitol)were called Hilltoppers as was the very good university basketball team. The university was too small at the time to fund a football team. The Hilltoppers rode in style to play away games or cross-town to friendly games with the University of Texas (they were obviously part of a more important league). But often the Hilltoppers would whip the UT team. What was the secret weapon? We at the high school had a theory. St. Edward's (both the high school and the university was run by the Congregation (brothers and priests) of the Holy Cross. There was an Indiana institution (University of Notre Dame) run by the same order. As we understood it, Notre Dame would send some of its best freshman players who were having scholastic problems our way. The Texas weather would improve their grades and while here they ran and dribbled circles around the lumbering Texas Longhorns. The Hilltopper was painted middle blue with a prominent bright yellow strip on the side. The shape was pure aerodynamics of the Chrysler Airflow kind and the scoop on the back was music to my eyes. It was the most beautiful bus in the world. 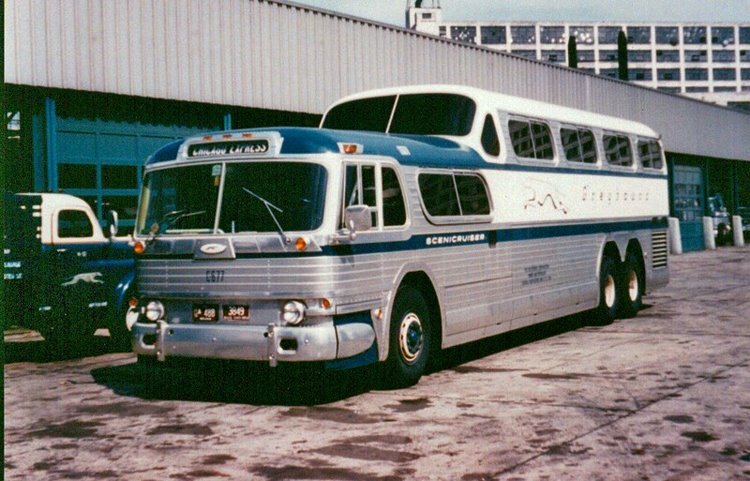 The bus was technically a Flxible Clipper which was manufactured in the early 50s. In 1913, Hugo H. Young and Carl F. Dudte founded the Flexible Sidecar Co. in Loudonville, Ohio, to manufacture motorcycle sidecars with a flexible mounting to the motorcycle. The flexible mounting allowed the sidecar to lean on corners along with the motorcycle, and was based on a design patented by Young. In 1919, the company's name was changed to The Flxible Co. so that the name could be copyrighted and used as a trademark (although it continued to be pronounced "flexible"). In 1957 I finished the 8th grade in Nueva Rosita, Coahuila. The closest grade 9 school in English was St. Edward's High School, a Catholic boarding school in Austin, Texas. I was shipped there by my mother. During those four years I would return to Nueva Rosita, or Mexico City for Christmas and for the summer holidays. 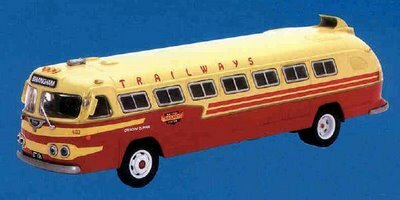 Except for a couple of exceptions those trips involved rides in wonderful buses, long gone, but still in my memory. One of those trips involved aerodynamics of the airplane kind. It was an airplane so beautiful which just happened to be the first commercial jet I flew in. It was a De Havilland Comet 4C. The air intakes flush and part of the wing were as beautiful as that scoop on the Hilltopper. In 1959 on my birthday for some reason we were in Mexico City. My mother sprung a pleasant surprise. In an envelope I found an American silver Dollar and a one-way ticket via Mexicana de Aviación to San Antonio. I asked my mother why the silver Dollar was there. My mother taught physics. She knew her stuff, "Alex when you are cruising in the Comet try and put the coin on its edge on your serving table. You will be surprised!" I was both surprised and thrilled. No piston-engine airliner of the time, even that gorgeous Lockheed Super Constellation, could stop vibrating in the air. The Comet 4C the first commercial jet in service was smooth. The coin remained on its edge without falling. On other years going back and forth between my school and Nueva Rosita involved two buses and a car. Someone would drive me from Nueva Rosita to Piedras Negras. I would cross the bridge to Eagle Pass. Eagle Pass then looked much like many of the towns in American Westerns films. While the streets were paved the sidewalks were high from the ground and boardwalks. Many were covered by the overhand from the building. Sometimes I would go to the Eagle Pass Hotel for breakfast. On the way to breakfast I would pass the main room that had a fireplace with Winchester repeating rifles on the wall. One time a tall man with hat and cowboy boots emerged from the coffee shop and he noisily sauntered on the boardwalk. It was John Wayne. In Eagle Pass I took a Continental Trailways to San Antoni. And, (yes!) it was a Flxible Clipper. Thinking back I realize that each bus driver had a personal punch with which he marked my ticket. The Flxible would take me through towns that are now all romance to my ears. Then, they were depressing as each brought me closer to school and away from my family. I was always a tad homesick. 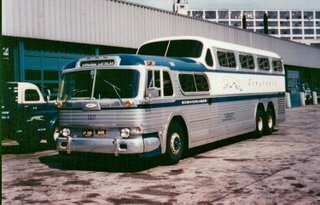 The bus stopped at Crystal City (the first city in the US to "go Mexican") voting in the first Mexican American city council around 1960. The Raza began in this lazy town with noisy swinging screen doors. The only language to be heard in the bus was Spanish. We then then stopped at such places as Carrizo Springs, and depending on the route of that day, Uvalde, Pearsall and Dilley before it arrived at the San Antonio bus station. There I switched to the imposing but not as beautiful Greyhound Scenicruiser. From the lazy narrow one-lane highways between Eagle Pass to San Antonio I was suddenly on a four-lane divided highway all the way to Austin. Texans called it an expressway. These concrete expressways were part of the Dwight D. Eisenhower System of Interstate and Defense Highways. This is where the American love for driving began. I remember that both Bob Hope and Bing Crosby appeared in full-page Life Magazine ads extolling the virtue of driving on concrete! The purpose of the concrete (while it was smooth for cars) was to stand the weight of battle tanks and artillery. Only once was I driven from Nueva Rosita to San Antonio. Jeanette Frazier, a widow who owned a large hacienda in Sabinas, Coahuila told my mother she was driving (in a big 1954 Buick Roadmaster) her daughter Cornelia to Uvalde to visit family. The town was close to San Antonio. Cornelia Frazier was a bit younger than I was. She was beautiful, spoiled, remote and didn't give me the time of day. We both sat in the back seat in complete silence all the way to Uvalde. She was my first Estella. Today, Cornelia lives in Eagle Pass, not far from her mother who is in her 90s.